The leading software for document creating and editing is now even more accessible with this release: interface in both Spanish and English without compromise on the quality. Businesses with employees that only speak Spanish will benefit greatly from this pack, as they can easily work with the software without the need of understanding English. 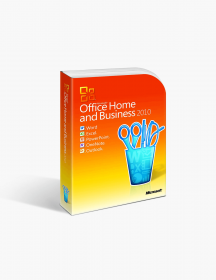 The Home and Business 2013 pack is also perfect for users who work from home and want to manage their personal files faster and easier with tools on a professional level. This product provides a license for one PC only, but it does not have an expiration date, so you could use it on your computer for as long as you like! Word 2013 - The text editor we all know and love is one of the statements in this pack. Coming to you with a myriad of tools, the app will provide you with everything you need to create professional documents - improved Ribbon interface for easy navigating, tons of templates, fonts, graphics to customize your files as well as adding online videos. The app has an improved Read Mode - the text is concise and divided into columns for a better reading experience and when you reopen a certain file you were reading, Word 2013 will open it on the same page when you left off for your convenience! Excel 2013 - Create spreadsheets, analyze your data, manage your finances effortlessly with the 2013 release of the Microsoft Office spreadsheet developer. Loaded up with brand new functions and tools to utilize your performance and help you work faster. Easily convert your data into a table or a chart with the new Quick Analysis tool with just a couple of steps. The Flash Fill tool is a great helper for the times you’re in a rush: it autocompletes data for you by studying your typing pattern and the data you put in. The Chart Recommendations tool suggest the most suitable charts to present your data. You also have the option to preview how your data will look in the different charts before committing to a particular one. PowerPoint 2013 - Packed full of new and improved tools for customizing your presentations and creating them exactly as you please, PowerPoint 2013 continues the tradition of the previous versions of being the best app for creating slide presentations. Even more themes to choose from with customizable color as well as size - now you can make your presentations to fit a widescreen device. What’s more, PowerPoint now supports an even wider variety of media formats such as .mp4 and .mov with H.264 video and AAC audio. It goes without saying that you can upload your projects to OneDrive and access them anytime you need. OneNote 2013 - OneNote 2013 is so far the best app on the market for storing any type of information and collaborate on projects. You can collect data, include pictures, audio and video files, screenshots, drawings, tables and almost everything else you can think of. But the best part about OneNote 2013 is that it’s especially made for collaborating and you can do that anywhere and anytime you like with the web app and through OneDrive where you can also save them and access them anytime. Outlook 2013 - Outlook 2013 is more than just a simple email client - it’s your personal assistant, as it manages your communication, tasks, meeting and even personal errands. You can sync all your email accounts and even connect your social networks like Facebook, LinkedIn, etc., so you can get notifications from them. For your convenience, Outlook 2013 includes some new features like previewing messages and the option to reply faster with inline replies. What’s more, the People Card function allows you to see all the info about a contact in a single place. New Functional Design - Microsoft Office 2013 Home and Business comes to you with a new clean and sophisticated design that doesn’t just look good, but is intended to help you work faster and more efficiently. The Ribbon in all apps is improved for your convenience and you also have the option to set up its look to your liking with the tools you use the most. 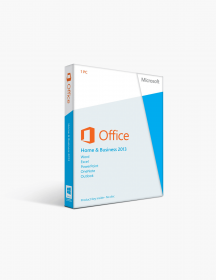 Create With a Single Touch - Now you can manage your work from your smartphone or your tablet because Microsoft Office 2013 Home and Business is optimized for use on touchscreen devices. Whenever you’re on the go or don’t have access to your computer, you can easily create files and share them straight from your phone. 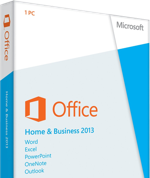 Why Choose Microsoft Office 2013 Home and Business License English/Spanish? 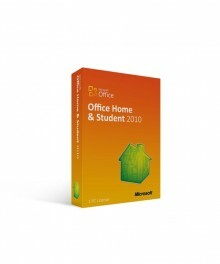 Spanish Interface - If you are more comfortable using your native Spanish language, this office pack is great for you! You won’t need to worry about not understanding or finding certain commands and tools and you would work with ease. Versatility - The full potential of the apps included in the suit will become obvious when you realize you can use them for tons of different things - you can analyze all types of data in Excel 2013, create visual charts and tables or compose a database. In Word 2013 you can create not just simple documents, but also brochures, postcards, newsletters, invitations and many more. MS Office will provide you with the right tools to create everything you need! Widely-recognized Quality - You’ve most likely used MS Office before, and if you haven’t - you have at least heard of it. And there’s a good reason for that - the office suite is simply the best one on the market and offers user-friendly interface without a compromise on the quality and functionality of the apps. 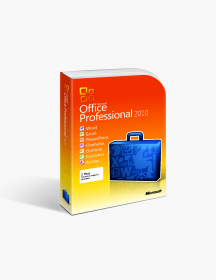 Millions of users all around the world praise the Microsoft Office productivity suite as simply essential and irreplaceable for their business and personal needs.